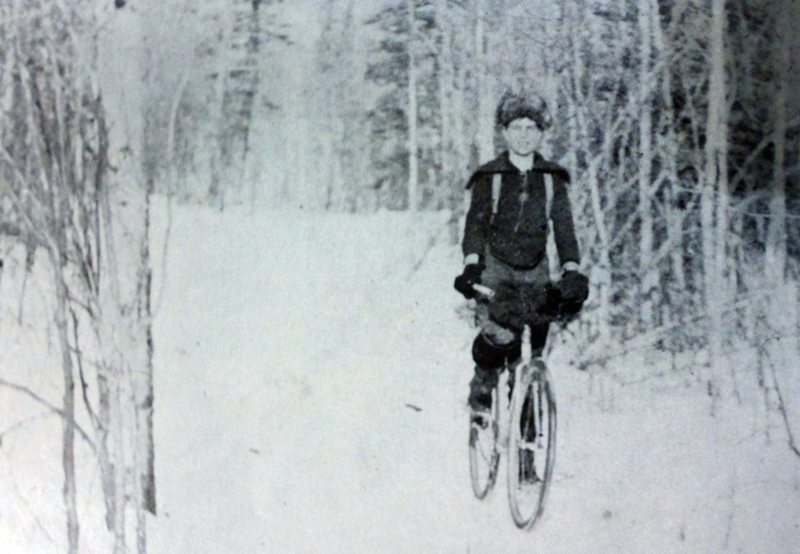 "We were on bicycles in the dead of winter in the middle of nowhere with no one to blame but ourselves." “Look!” one of us wanted to shout along the way, “We’re doing it! We’re riding our bikes 32 miles in the snow!” No one noticed, though, except to give a look that said, “You’re total assholes,” because we really aren’t any of those things we wanted to think we were. Instead, nostrils froze together almost immediately. Paper bags finally gave out from the wetness of snow, which sent the packages we were carrying every which way into the street. We really have no business doing this, we thought, but we did it anyway, because we thought we could. Clouds had rolled in quickly over the mountains and brought the sky down to eye level. Hard round flakes accompanied headwinds that burrowed into the cracks of our clothes armor. With seven miles to go we really began to wonder what we were proving by riding all this way in winter. Eyes have a way of watering in the freezing breeze, we knew. Beards grow thick with ice chunks, too, and legs begin to ache as blood grows viscous in the cold, and this is exactly what happened. Everything was exponentially slowing on this stretch of lonely road while the snow pelted us repeatedly with no regard. The lifestyle we were hitherto living was one in which we relied too often, we thought, on things we really had no knowledge of, like the innerworkings of a car engine, and that bothered us to some abstract and troubling degree, but now here we were growing sore and questioning our choice. Whereas we were once continually at the mercy of dealership mechanics and forced to trust their assessments, now we were on bicycles in the dead of winter in the middle of nowhere with no one to blame but ourselves. We hadn’t liked that if and when our cars used to need work we were completely powerless as to how to fix them, but now we knew exactly what had to happen: we just had to keep pedaling, but we didn’t want to—we wanted to just lie down in the ditch and rest and let ourselves be covered with snow and give up and apologize. And so we did. We lay down and stared up. But it was uncomfortable, our prostration, and so we climbed out of the ditch and into the saddle again and pointed our front wheels northward and rode. As hard as we could we pedaled home and when we made it we built a fire and drank a beer and got to work because we knew it could not stay winter forever.